We charge a non-refundable RV Registration fee. The fee reserves a spot for you on a first-come, first-served basis and includes the use of the River Run Lodge #2 facilities. Your Registration fee can be paid over the phone, through the mail, or online. Your pass will NOT be mailed to you; please pick it up from Jazz registration at the same time you pick up your badges. The RV lot will open at noon on the Saturday immediately preceding the event (October 15th). No power or hookups are available. A separate location will be available for those who desire to run their generators through the night. Please check with the hosts when you arrive. On behalf of the Directors of the Sun Valley Jazz and Music Festival and the Sun Valley Company, I would like to welcome you to the Sun Valley Jazz RV Parking area. RV Registration: Obtain your pass either from the RV Hosts or at Registration in the Sun Valley Inn. Please display your pass where the hosts can see it by driving by on the fire lanes. There are no refunds. Quiet Hours: From 11:00 pm until 7:00 am. Please, do not run generators, no loud music, no loud talking or other obnoxious noises that may bother others. Please preserve the right to quiet for your nearby neighbors and Ketchum residents. If you want to use generator power all night, please see RV Host for generator area parking. All other quiet rules must be observed even in the generator parking area. Food: Do Not leave food items out as you may attract some unwanted dinner guests. Laundry: Do not hang laundry or put up an outside clothesline in the event RV parking areas. Campfires: No open campfires. Propane type fire places are okay as long as someone is by the fire. If you walk away, please turn it off. Trash: Put your trash in proper receptacles. The Event Coordinator has provided a dumpster for you to utilize. Waste Water: DO NOT dump grey or black water on the ground. Being caught doing so will result in possible fines and automatic expulsion from the RV Event Parking area. The newest RV dump is located 11.8 miles in Hailey. ID. It is located across from the airport next to the Shell Station. Pets: Clean up after your pets…you know what we mean! Environment: Do not change oil or perform other environmentally unsafe practices on Sun Valley property. Secure: DO lock and secure your equipment while you are away from your unit. 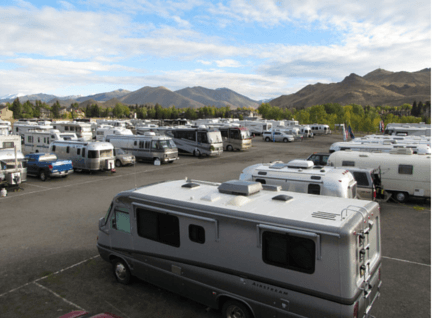 Common Sense: Use your RV common sense and we can preserve the privilege of using Sun Valley parking areas for RV Events parking. Safe Travels: The Sun Valley Company requests that all camping activity cease at 11:00 am on Monday, October 24th. 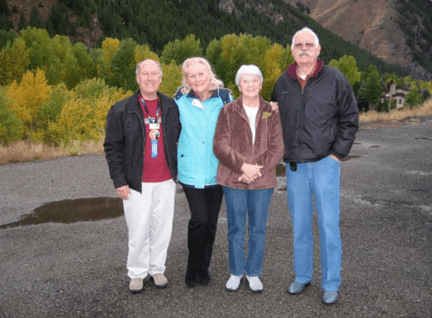 Thank you for cooperating with the staff and management of the Sun Valley Jazz Jamboree, the Sun Valley Company, and the wonderful residents who live in this area. Some helpful hints that will help you with your “dry camping” experience without hook-ups. Run your shower long enough to get wet, turn off water, soap down and then rinse off. Sink baths or shaving? Put water in small basin. Use just enough to perform your task. Throw water down toilet into black tank. Dishes: Use a basin to perform task. When finished, dump down toilet into black water tank. We generate more grey water than black water during our RV stays and it seems as if the grey water tank is smaller than the black water tank. Fact: It can get hot during the day in Sun Valley. We have a tendency to run the AC when we aren’t around or to keep our pets comfortable. Consider a higher setting than you are accustomed to with your pet. Otherwise, don’t waste power and fuel running your AC. Try opening windows and vents while you are away. Charging batteries does not require more than 2 hours of generator time. Read your RV manual. Turn off lights and equipment that you are not using. Remember, this isn’t your house. Only turn on your hot water heater 15 minutes before you need it in the morning. The water will still be warm enough for hand washing and other stuff throughout the day. Think solar. It will run small appliances and help charge your batteries on sunshine days. Did you know that running your heater all night will deplete your batteries faster than any thing else you use in your coach? I had my dealer put in a propane quick disconnect and I use a catalytic heater to keep the chill off during the nights I get cold. Add an inverter if you don’t have one. Then you can use battery power to run your TV and keep the outdoors quiet. Do you have a CPAP machine? Consider a 12 volt connection when boondocking. I had a 12 volt adaptor wired in next to the bed. It uses very little battery power even after a full nights use. Make sure yours can be used on 12 volt and then see a Radio Shack Representative. No all-night generator noise! !